Did you know that frog tongues are attached to the front of their mouths instead of the back? This makes it easy to grab food, and toss it down their throats. While your baby is dressed in this Baby Lil Froggy Costume, you won't have to worry about him picking up this ability. But you may want to worry if he does start getting a craving for flies. "RRRRRRRIBBIT"There's been a lot of famous frogs in history, but none more awesome than your child when they go in this adorable costume. Kermit won't stand a chance! Watch your child fill up bag after bag while trick or treating. Just pay attention when you walk by the pond. You don't want them disappearing into the water to go for a froggie swim! Some people think frogs are icky, but we think frogs are cute. That's mostly because we know what your baby will look like wearing this froggy costume and it's downright adorable. 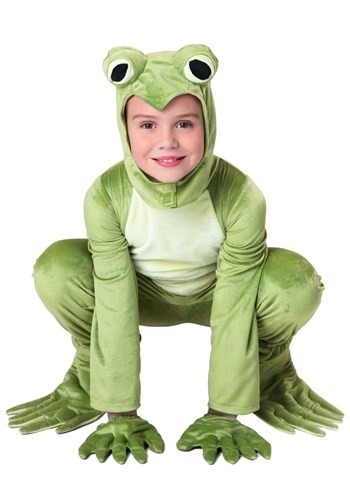 If you're feeling a little froggy, then leap for this Deluxe Frog Mascot Costume! 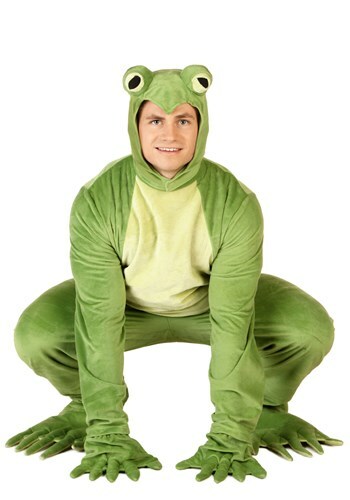 This is the perfect costume for amphibian and reptile lovers. You can also wear this mascot costume to support your favorite team! Wear it to all the games and cheer on the home team! 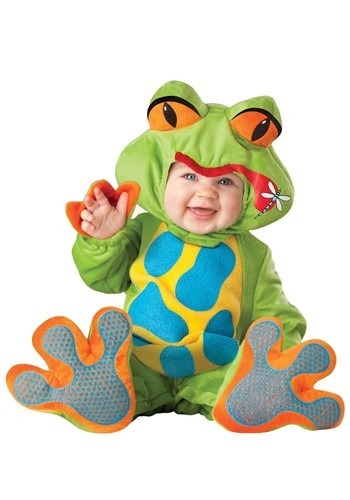 Your baby will love hopping around in this Infant Frog Costume! He can become a jungle-dweller like none other. Great for Halloween or a rain-forest theme party. Get set for adventure! Kids who are always looking for the Rainbow Connection will love this Toddler Deluxe Frog Costume! Kids who like playing in mud will love it, too--just find them the nearest swamp and they'll be in frog heaven. 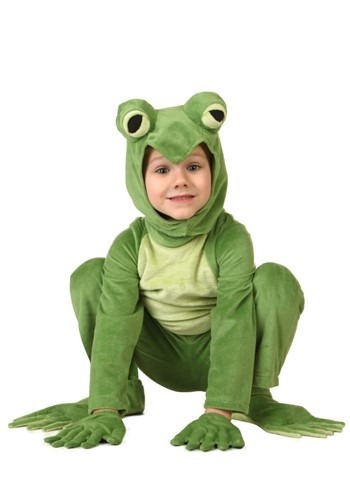 Your child will love hopping around in this Toddler Frog Costume! Let him explore a rain forest this Halloween. It may not be easy being green, but your toddler can give it a shot. The light green tones help him blend in at the pond when he's hiding from Miss Piggy and the collar gives him a dash of swag that all the other Muppets are jealous of. And how many frogs can say they have star on the Hollywood Walk of Fame? Only Kermit! Got a bug problem? Just dress your toddler up in this frog costume and your little one might gain an absurd craving for flies. It has the classic look of a happy little pond frog, so we can't help it if the natural love for bugs as a bedtime snack rubs off on him too.